These are the words from inspiring women – Kat Abianac. I haven’t met Kat in person, but I’ve been following her from afar for a few years. 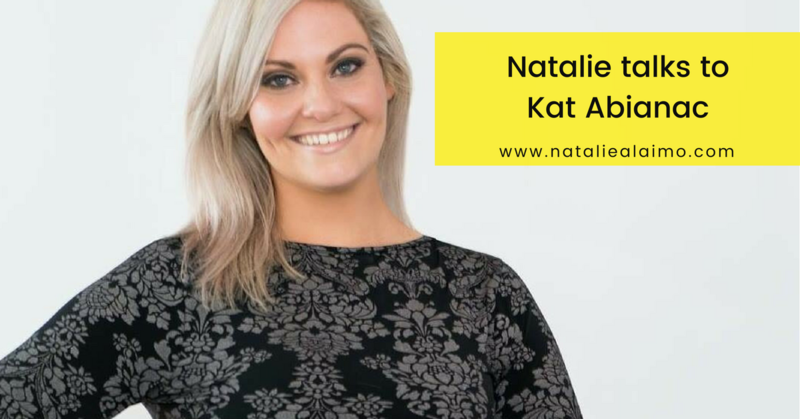 She is a single mum, social media maven and kick arse business owner who is on her way to a 7 figure income. She is building her empire with her children in tow and her story is nothing short of inspirational. 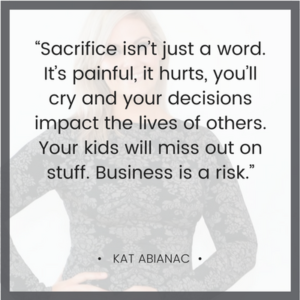 Keep reading for amazing insights from Kat Abianac. I’m a Mum of 2 living in Brisbane Australia. My 4 year old son Parker has Down syndrome and loves to read and swim, which I encourage being from QLD! My daughter Annerley is a talented musician and loves learning more about design & art. I run an essential oils business from home, using products from the biggest essential oil company in the world, DoTERRA. I also have strategy clients and run online courses to assist people in community management, mindset, tech skills and learning to show up online. I have an incredible executive assistant Callie, a social media manager Kate and have a small team of other part time staff who support me with admin and the day to day running of my business. Attending live workshops and events is one of my favourite things to do, and I highly recommend real life events and networking to anyone building ANY business from their home. You can’t replace real life conversations and experiences. I wake up between 5-5:45am and work until my son wakes up. After he’s picked up by his home daycare Mum/Dad for school around 9, I start my day with a very large coffee, review my emails and do some morning meditation or EFT tapping. My EA calls me at 9:30am and we set up my calendar for the day, and talk through strategies for anything coming up. This check in is exceptionally important as when I focus on business strategy I forget about the day to day household tasks- she reminds me to order formula, put in a Coles order and reschedules my PT sessions. Hiring an EA really supported me to take my business next level and learn to delegate. I have a break from all appointments and meetings between 10:30-2:30 daily. I’ve learned over the years I don’t peak in productivity until 3:30pm so I save the in-person stuff for then wherever I can. My Calendly has rules set up so none of my strategy clients can book sessions in that window. My son arrives home from school around 6pm and I generally work another hour or two after my children are in bed. It’s defibitely not sustainable long term, but while I build my business it’s been easier to treat work as my ‘default’ and make sure life is scheduled as a priority throughout, instead of the other way round. I make sure to practice regular self care and have days off when I’m feeling drained. Luckily I have an incredible team who can help fill the gaps where needed. I’m working on scaling my business further over the next 12 months, and increasing my company revenue while I continue to develop tight systems for my small team so they can be scaled with my company. Systems have been the key to my success and before I discovered this, I struggled to keep up with the momentum I’d created through marketing my social media course and building my essential oil business. I founded my company 5 months ago, and while I know my revenue will shift as life events occur, I’m structuring my company so it can continue to run cleanly in my absence. It’s a double edged sword. Women want to spend time at home with their children and on average have far more hurdles and societal expectations placed on them than men. One of the biggest shifts I made was learning to delegate. I host au pairs, I hire nannies and spend a fortune on daycare- as the marketing shift continues to trend toward social media and away from mainstream broadcast, so many opportunities have opened for women to learn to run incredible businesses from their home. But regardless of what business is started, scaling and growing to 7 figures annually is hard work and you require support. I found reaching out and making sacrifices to find time to build offline connections was what helped me the most with my long term goals, and I always remind myself it’s important to get out of the house and into the real world- even if you’re not the one tucking your children into bed that night. I intend to scale my company to 7 figures and create opportunities to travel with my family while my children are young. Building my essential oils business and setting up long term investments is a high priority in the next 4-5 years. My ten year goals change every time I talk about them, so I won’t go there! Who knows. Mindset coaching has proven invaluable for me and I’m blessed to have a coach George Kats who really helped me with financial stuff. Once I nail the mindset on a certain issue, and reach out to connect with those who went before me, the rest is all just hard work and missing a couple of bedtimes. I have no doubt I’ll have a few more sleepless nights before my company hits 7 figures but I have a good arsenal of tools at my disposal and I’ll always continue to lift other women as I rise. Constance Hall. She is an incredible person inside and out. Trusting, loyal and has a brilliant mind. I wouldn’t be where I am today if it weren’t for her unfailing confidence and belief in my abilities, and I’ll never stop admiring her for showing up as exactly who she is. Oprah is obviously an inspiration to most women, and watching some of her older stuff is incredibly enlightening. She has shared her entire journey to success and Google has placed it at our fingertips. I highly recommend a deep dive in there and wrapping your head around everything she overcame to become the woman she is today. My daughter inspires me daily. Helping her with her problems is like running a company but scaled right all the way down. It always, always comes back to mindset, and she’s such a quick learner. I’m so proud of all her achievements and I show up in part to make her proud of me. I went into business for myself because I needed the flexibility a full time job simply couldn’t provide. Making final decisions allows me to be a carer for my son Parker when required, or to prioritise my family higher when called for. It’s such a relief knowing if push came to shove I could take a month off work and the world wouldn’t fall down around my ears- I know it sounds counterintuitive but removing the sense of obligation we all feel when showing up and doing our best for an employer, and placing it on ourselves, changed the way I see the world and how I choose to show up in it. My family keeps me going- always. As does thinking about an essay I wrote when I was 6. I wrote about what I’d be like as an adult when I grew up. I won’t share the list, but I intend to honour little Kat’s every last one and do her proud. Sacrifice isn’t just a word. It’s painful, it hurts, you’ll cry and your decisions impact the lives of others. Your kids will miss out on stuff. Business is a risk. Always have long term strategic goals you can fall back on, so you can stay regulated and assess every decision on logic instead of emotion. Practice self care. It’s not selfish, lose the stories and go get a massage before your stomach ends up in so many knots you get an ulcer. I’ve spent a fortune in courses and coaches and educating myself, as well as taking practical action and buying tools and resources. The more lessons I learn in the early days, the lower the risk of screwing up something in my business once it’s scaled. If you’re not making mistakes, you’re not living your best life or learning the lessons you need to. Pat Flynn- Smart Passive Income. For entrepreneurs scaling from 6 figures to 7, I highly recommend James Schramko’s podcasts. Dan Norris has a terrific membership group, www.dannorris.me and has written some excellent books including The 7 Day Start Up. Elizabeth Gilbert has nothing to do with business per se however no one should start a business before they read Big Magic. The book The Big Leap helped me work on upper limiting myself, and how to push through to go next level each time. Tim Ferris’ The 4 Hour Work Week should always be the starting point for anyone looking to transition from employment to entrepreneurship.